I began calling square dances in the age old callers tradition; meaning the caller didn’t show up and I was one of the only people present that had any idea what a caller even did. This video is of the first dance I ever called. It was March 2004 in Portland, Oregon. My friend Phranque asked me to play fiddle for the first gathering of the Underground Square Dance Association (USDA), AKA his 50th birthday party. It took place on a wide platform at the Washington Park MAX stop, Portland’s only underground train station. But when the caller failed to show up I suddenly found myself thrust into the position of having to imitate a real caller. I surprised myself and was able to keep people dancing for two hours on what I had absorbed from going to square dances. I understood the moves, I just lacked the vocabulary. It didn’t take long before calling dances became party of my identity and a skill that I would carry all over the country and beyond. Since 2004 I have called dances all over the country including the The Appalachian String Band Music Festival, Clifftop, WV, The Festival of American Fiddle Tunes, Port Townsend, WA, The Chicago Barn Dance, Chicago, IL, The Berkeley Old Time Music Convention, Berkeley, CA, The Portland Old Time Music Gathering, Portland, OR, The Nimble Fingers Bluegrass and Old Time Workshop, Sorrento, BC, and participated in six of the Dare To Be Square callers conferences around the country. I have helped motivate people to square dance as far away as Mexico, Canada, and even two trips to China. I am available for calling dances at your event, wedding, private party, or family reunion. I have over 13 years experience getting people who don’t know anything about dancing to get on the dance floor and move their bodies. I can even bring a band with me. Contact me for details, availability, and pricing. Below are examples of my calling style as well as a video about the Portland, Oregon square dance community that I helped foster. Video by Doug Plummer. Michael Ismerio calls a Take A Peek at the 2009 Portland Old Time Gathering. Music by Ebenezer (Caitlin Daum fiddle, Scott Killops banjo, Robin Wilcox bass, Ryan Fitzpatrick mandolin and Patrick Pressley, guitar). Video by Doug Plummer. Old-time music and square dancing in Portland, Oregon. Interviews with Bill Martin and Michael Ismerio, and footage from the Old Time Music Gathering, reveal the intimate links between the old-time music scene and the revival of square dancing. Here are a couple of recordings of me calling dances with a fabulous band consisting of Sammy Lind, Caleb Klauder, Nadine Landry, Pharis Romero, and Jason Romero. What goes on in the mind of a caller? how do you keep track of all the dancers? How do you know what to say? And when to make the calls? How do you efficiently teach the dances? 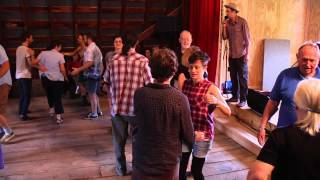 What makes traditional southern square dancing different from Contra Dancing and modern western square dancing? What do you need to tell the musicians? How do you keep people excited and having fun? If you have asked yourself any of these questions then this workshop is for you. We will get to the core of what makes traditional southern square dancing unique and fun and give you the building blocks you will need to call your own dances. This workshop will be equally interesting for beginning or experienced callers even if you have never called a dance before. Get a hold of me to talk about bringing this workshop to your community. 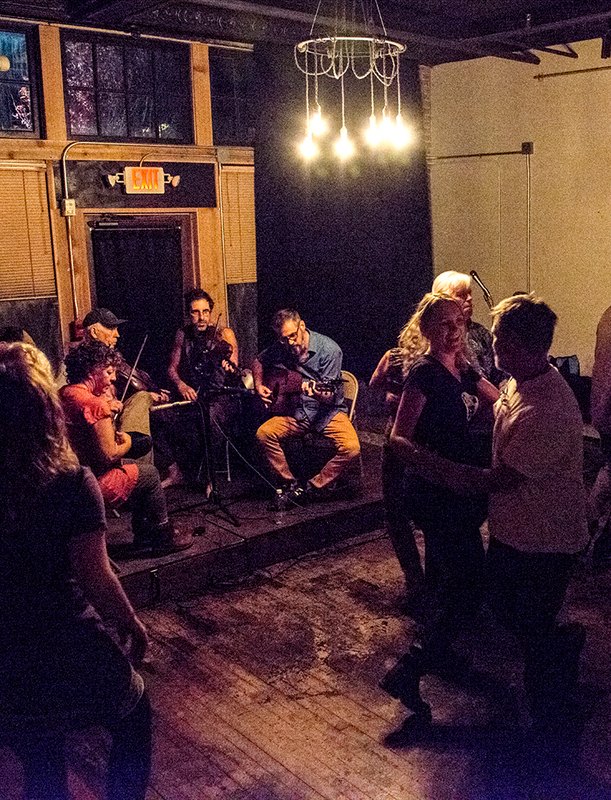 My community in Asheville, NC has a monthly square dance on the first Friday of every month at the Habitat Tavern (174 Broadway St.) in downtown Asheville. The dance is all ages, no experience necessary, and free to the public. It is also open band and open caller so you can polish your calling skills with real live dancers or play in the band, provided you can play fast enough. Dancing starts at 8pm. Beer and wine are available. And it is an incredibly welcoming environment for beginners and newcomers. In the summer months we often move the dance to an outdoor covered pavilion at Ivy Creek Family Farm in Barnardsville just north of Asheville. Lucky for me, Portland was graced with Bill “Bubba” Martin, an amazing caller who taught and called southern Appalachian traditional dances in Portland since the seventies. He graciously took me and the new generation of young callers under his wing and walked us through the paces. He shared with us everything he could and only quietly complained as we started making off with his calling gigs. Bill Martin was Portland’s premier square dance caller, teacher, and our spiritual guru. 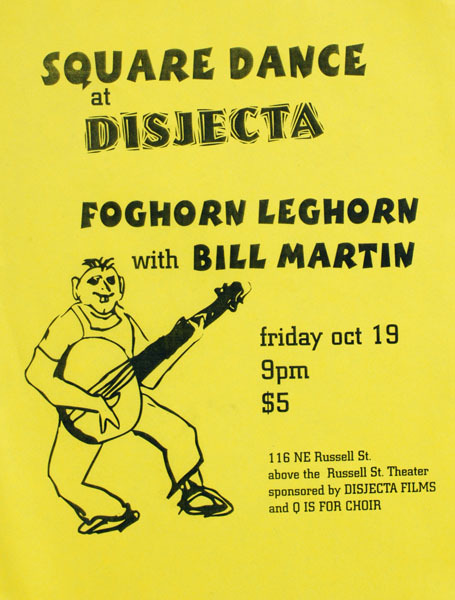 In October 2001, I organized my first (of many) community square dance in Portland with Bill Martin and the first incarnation of the Foghorn Stringband. (Bill made the Poster). Read Phil Jamison’s original Dare To Be Square article from 1988. And Phil’s follow up D2BS article from 2003. A Look At Southern Squares ~ Bill Martin’s collection of Southern square dance figures. Dare To Be Square 2010 dance and workshop notes ~ Bill Martin’s notes and handouts presented at the festival in Seattle. West Virginia Square Dances ~ An online version of Bob Dalsemer’s great out-of-print collection of dances, histories, stories, including live recordings of square dances in West Virginia. Hugh Stewart’s Running Sets ~ Briton Hugh Stewart’s fine collection of the old “running set” dance figures. Old Time Seattle ~ Old-time music and square dancing in Seattle. Country Dance & Song Society’s collection of square dance video and audio .